How Do Non-Flowering Plants Reproduce? Flowers are often the showiest part of most plants, but their main function is facilitating reproduction through seeds. However, there are many plants out there which never produce flowers. Mosses are tiny plants that grow as a green carpet in moist areas. They are called non-vascular plants since they don't have true roots that absorb water or stems that transport it to other parts of the plant. Instead, moisture is absorbed through the entire body. Mosses have sexual and asexual phases in their life cycle. During the sexual reproduction phase, the plants produce two structures, one male and one female, usually on different plants. The sperm swims towards the egg to complete fertilization; thus, water is required for the moss to reproduce sexually. The tiny, hooked structures that rise above the moss carpet are the sporophytes with spore-bearing capsules or sporangia. They grow on top of the fertilized female gametophyte plants. The spores released from mature sporangia grow into new male and female plants when they land on moist surfaces. 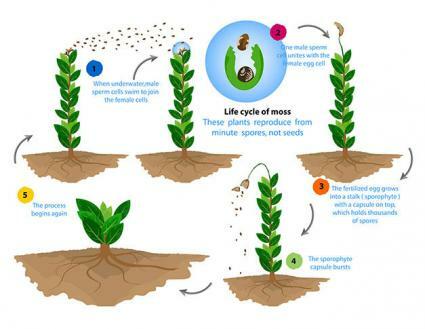 Asexual reproduction occurs when any part of the stem or even a leaf breaks off of a plant and regenerates to create a new moss plant. Some gardeners successfully use ornamental mosses in moist, shady areas, while others consider them weeds. Sphagnum moss/peat moss used extensively in gardening is dried moss. Liverworts and hornworts are two other types of non-flowering, non-vascular plants similar to mosses. They are small, flat, ground-hugging plants growing in damp areas. They have reproductive cycles similar to mosses and send up sporophytes with umbrella-like or rod-like sporangia. Ferns are highly valued in the gardening circles for their feathery fronds. Unlike mosses, ferns are vascular plants and have roots and stems that conduct water. However, the stems of ferns, except in the case of tree ferns, are rhizomes that grow along the ground or underground, so the only part visible is the tuft of leaves. What is most interesting about these leaves is that they do double duty as the reproductive structures of these plants. Ferns ruled the world at one time when the earth was literally a warm, steamy greenhouse. But now they are more commonly found in tropical and subtropical areas. One of the reasons is that, like mosses, they need water as a medium to complete their reproductive process. Most ferns reproduce through spores found underneath leaves. When mature, the spores explode and release a dark brown, dust-like substance. When this comes in contact with warm and moist soil, the process of reproduction begins. When the humidity, light and temperature is ideal, new fern plants grow. The conspicuous fern plants are the sporophytes. However, not all leaves of a fern plant bear spores. The ones that carry the sporangia, usually on their underside, are called sporophylls. If the conditions are favorable, some of the mature spores falling on moist soil may germinate into a tiny heart-shaped structure called prothallus. This is the gametophyte phase of ferns. The inconspicuous prothallus produces the male and female gametes, but for fertilization to take place, the male cells need to reach the female cells by swimming through a film of water. 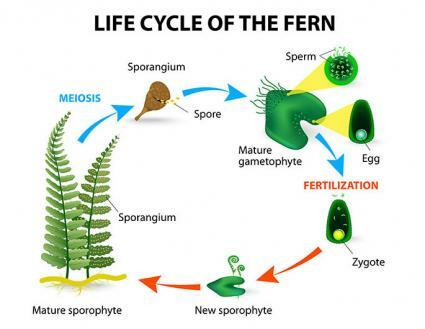 New fern plants develop from the fertilized femal plant (called zygote), but they take a long time to become good sized plants. There are a number of other non-flowering vascular plant groups, such as club moss and spikemoss, generally known as fern allies. They have more in common with ferns than mosses in that they have roots and stems with water-conducting tissue and spore-bearing fronds. Spikemoss, with soft fronds, are garden favorites. Club moss, which has scale-like leaves and grow wild in forest floors, are known by common names such as ground pine, ground cedar, and running pine. Whisk ferns and horsetails are two other spore-bearing vascular plants without conspicuous leaves, their tubular green stems taking care of photosynthesis. Seed producing non-flowering plants include cycads and conifers. Since they have no flowers or fruits, their seeds have no protective covering. 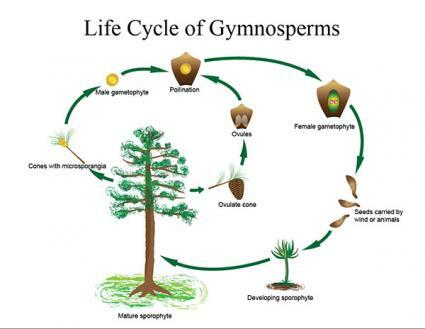 So they are called gymnosperms, which means naked seeds. These are woody evergreen plants with a palm-like appearance. There are separate male and female plants which are the sporophytes of their life cycle. The male plants carry reproductive structures called microsporophylls in a cone-like structure right at the top of their crown. They produce pollen. The female plant produces megasporophylls that are loosely arranged in a whorl in the middle of the leaves. They typically carry large ovules. In fact, cycads have the largest ovules in the plant kingdom. The female gametophyte develops inside the ovule while the male gametophyte is the pollen. Cycads are wind or insect pollinated. The pollen falling on an ovule on the megasporophylls grows a pollen tube to carry the male gamete to the egg cell. However, the tip of the pollen tube eventually breaks, releasing the sperm cells which have to swim towards the egg cell to fertilize it. Fertilized ovules develop into viable seeds over a period of several months. 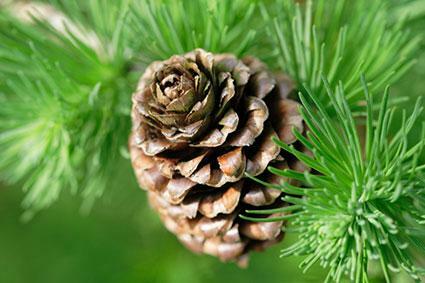 Cone-bearing evergreens such as firs, birches and pines reproduce by scaly seeds that develop inside female cones. Unlike cycads, both male and female cones develop on the same plant, but on separate branches. The conifer plants we see are the sporophytes. The smaller male cones carry microspores that produce pollen while the larger female cones carry the ovules that form megaspores. The male and female gametophytes develop inside the microspore and megaspore respectively. The pollen is actually the male gametophyte. The wind carries the pollen to the female cone where the male gametophyte develops further and sends out a pollen tube to reach the egg cell in the female gametophyte. After fertilization, the seeds develop inside the tightly closed female cones until they are mature. It may take two years or more, but once ready, the cones open up, exposing the naked seeds. Maidenhair fern trees (Gingko biloba) and Gnetales are also non-flowering plants. Cone-like structures on male plants produce pollen and the female plants produce the ovules that eventually become seeds. Although they are gymnosperms, their nut-like seeds have a fleshy seed coat which makes them look like fruits. Sexual reproduction is the key to genetic diversity and survival. Not all non-flowering plants reproduce by spores. At the same time, mushrooms and toadstools that reproduce by spores are not considered plants. They have their own plant kingdom together with other fungi like puffballs, mold, and rusts. Non-flowering plants add beauty and diversity to any garden area. Consider including them to your landscape where they will be valued for their foliage, texture, and unique characteristics.